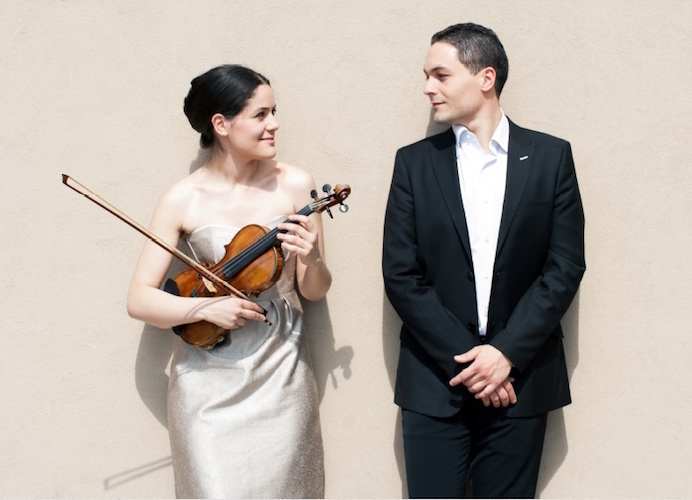 Α brother and sister duo of mixed Greek and French origins: A program of French compositions from the turn of the 20th century by Debussy, Satie and Fauré. Marie Claudine Papadopoulos studied at the Strasbourg conservatory in France from which she graduated with the highest distinction (gold medal) at the age of 14 in 2001. She subsequently studied at the Musikhochschule in Karlsruhe and Manheim and at the Conservatoire National Supérieur in Paris. She has since performed in numerous orchestras as soloist, notably in Germany, and has received and been finalist for numerous prizes including 1st prize in the Ton und Erkärung competition of the Deutsche Wirtschadt in Munich. She plays on a N. Amati violin graciously let to her by a private collector. Dimitri Papadopoulos was born in Princeton, NJ, USA, in 1985. He studied music in France and Germany, where he obtained the highest diplomas – 1st prize at the Conservatoire national supérieur musique et danse of Lyon, Franceclass of Edson Elias, and Master of Professional Performance, Folkwang-Universität Essen, class of Arnulf von Arnim. He has since performed widely solo, in chamber music and soloist with orchestra in numerous venues in Europe and the USA receinving frurther prizes in competitions in France, Italy and Germany. He plays frequntly for the Franch national radio stinton, France Musique and teaches piano at the Conservatory in Geneva, Switzerland.